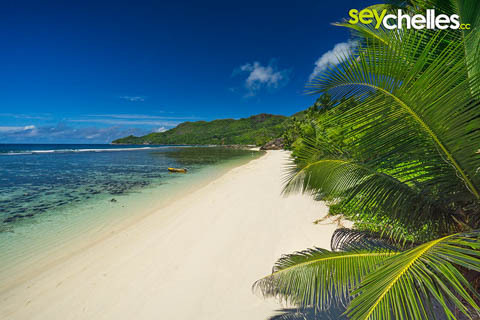 No doubt Mahé has some of the most beautiful beaches not only on the Seychelles but all over the world. 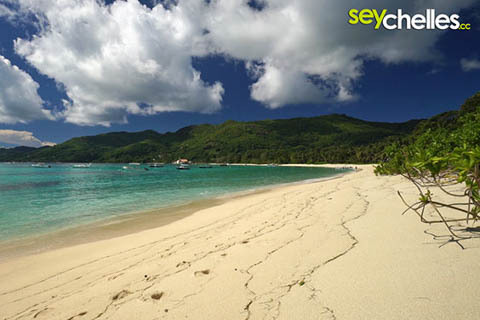 In this category, we will introduce you to the beaches of Mahé. We try to cover all of them, but some are still missing and we give our best to complete the list with images and info. 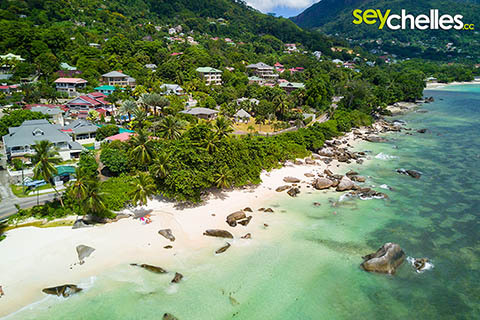 Since we have to start somewhere, we will do that with our favourite beach Anse Intendance in the very south and continue clockwise around the island. Enjoy the tour. 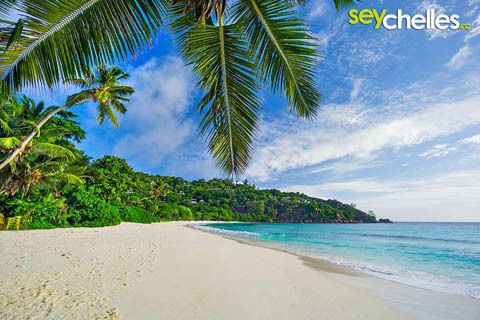 Situated in the beautiful south of Seychelles main island Mahé, Anse Takamaka used to be one of the most picturesque beaches in the Seychelles. Sadly some of the overhanging palm trees (read more about overhanging palm trees) on Anse Takamaka have been washed out by the surf. Leaving a still beautiful beach, but losing some of its past attraction. New ones will grow, promised ;). If you´d like to get a print of the perfect look that beach had once - we are preparing a webshop for prints - you can contact us in the meantime for individual requests. 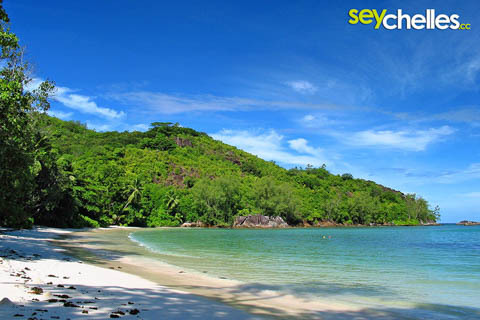 The beach is around 400m long, spotted by some takamaka trees and the typical granite rocks. 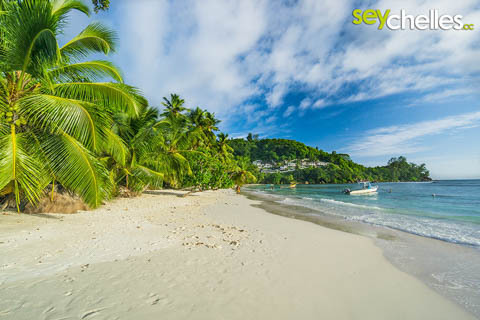 At the southern end of the sandy beach, there is a typical Seychellois restaurant which belongs to the small Hotel Chez Batista and serves very good fish. If you ever wanted to taste a red snapper right on a beach, this is the place to go. Access to the water is pretty good. There are some coral blocks and stones in the sandy lagoon, but you can find ways to into the water, especially near Chez Batista. 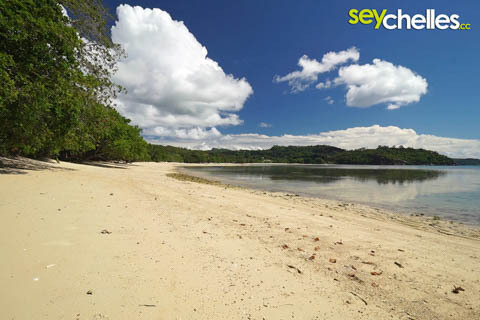 Waves are usually rather gentle, so this beach is good for a day on the beach with your family. Parking is limited, but Anse Takamaka is right along the very calm road that circles Mahé, so it is very easy to access by car and taxi. 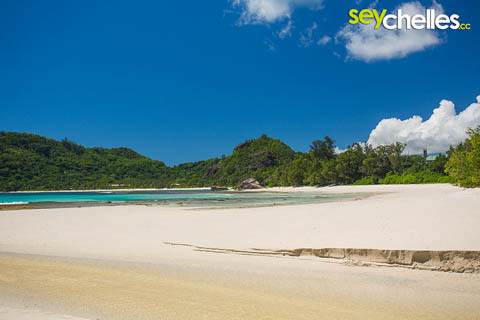 Forming a beautiful half moon bay, just north of Anse Takamaka on Mahé, Baie Lazare is an about 2 km long sandy beach, divided in two by a few granite rocks right in the middle. On one part you can find the villas of the Kempinski Resort widely scattered in a garden behind the beach, the other part is easily reached from the coastal road. Corals are coming near the beach almost all along, but depending on the tides it is good for relaxing in the shallow water. There is one place that is almost coral free where you can easily access the water. 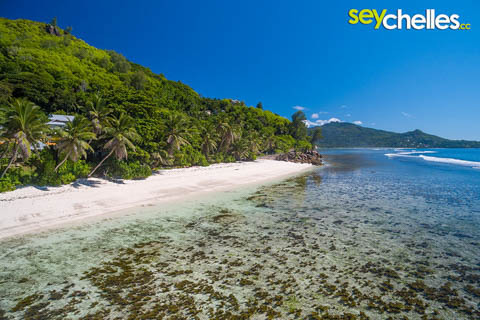 Watch our video about Mahé beaches, our aerial view of Baie Lazare will give you a good impression. If you would like to get to the other half of Baie Lazare you have to take the road around the Kempinski Hotel. Follow the main road to the north and drive left at the junction after the petrol station. After a while, you have to turn left and follow a very narrow road. Be aware, opposing traffic is nothing you´d want on this road, so if you don´t feel comfortable using your reverse gear, you´d better skip this part of Baie Lazare and watch it from the top of the rocks that divide the two parts. 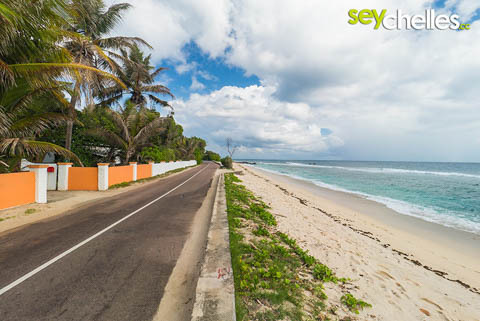 If you are keen enough and managed to drive to the beach, you can park your car there and follow the dirt-road to Anse Government. That´s something we plan for our next trip. 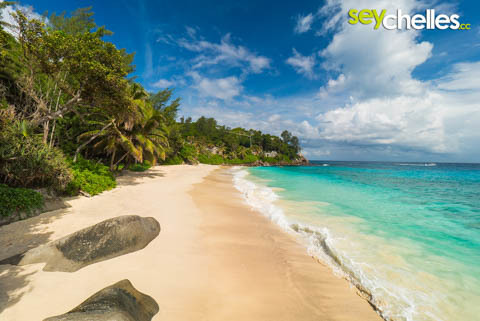 Petite Anse, also called Anse La Liberté on Mahé is one of the beaches that are the property of a big luxury hotel group. 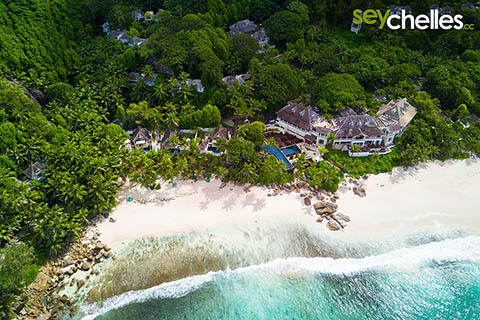 It is the home of the Four Seasons Resort Seychelles. Luckily visitors are allowed to access the beach. You are welcome to register at the hotel entrance, leaving your car at the parking ground, and can walk down the road to the beach. 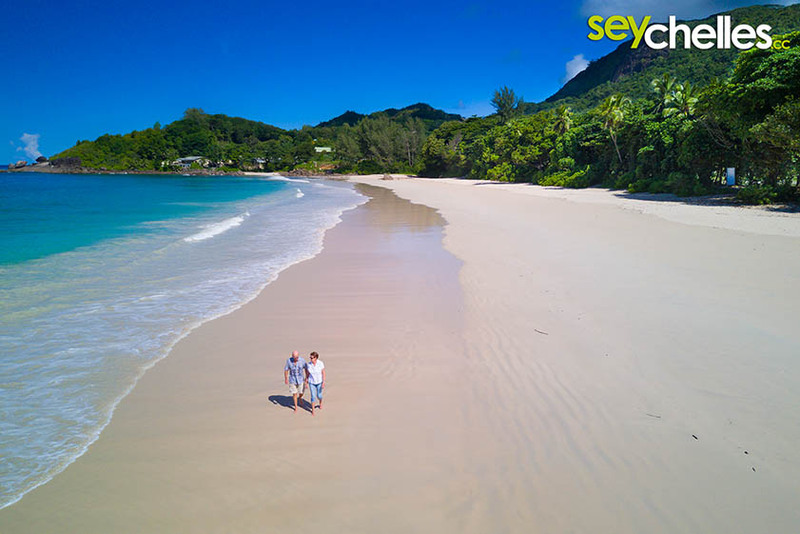 This beach is one of the most amazing on the Seychelles and while the Four Seasons Resort is really built beautifully into the surrounding hills, it must have been even more beautiful and perhaps one of the most beautiful beaches in the world before the hotel was built. The hotel staff btw. is really friendly and may even ask you if you need a ride in their golf cart when you walk back up the hill after your visit. Swimming on Petite Anse is great and there is even some shade. If you have booked the four seasons hotel there are enough sunchairs under palm thatched umbrellas that don´t even disturb the look of the beach. 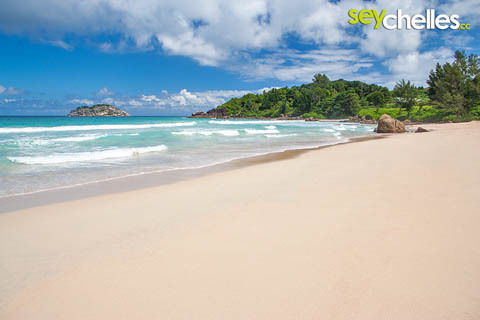 Anse Soleil is a beach that isn´t too well known. It is not really easy to find. However, if you know where it is and how to get there, it is pretty easy to access. 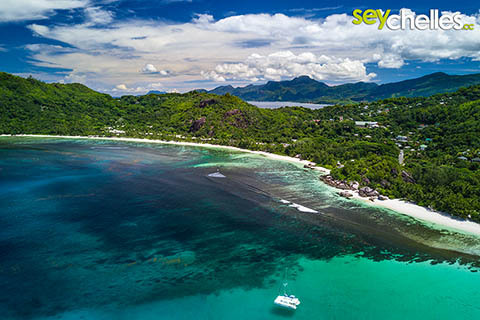 Driving on the West Coast Road to the north, go to the left, taking the road to Four Seasons Resort Seychelles right after the church in Baie Lazare. Follow the road to the Four Seasons and right at the entrance follow the small road to the right and you´ll arrive a few seconds later. A "small" problem is parking. It is prohibited on the private property there and people (from Anse Soleil Restaurant) fiercely approach you as soon as you reach the place, offering to park for € 50.00 before you even stop your car - not particularly friendly. So better look for a parkground further up the road and walk down. Unfortunately, you also have to walk right through the same restaurant to reach the beach. 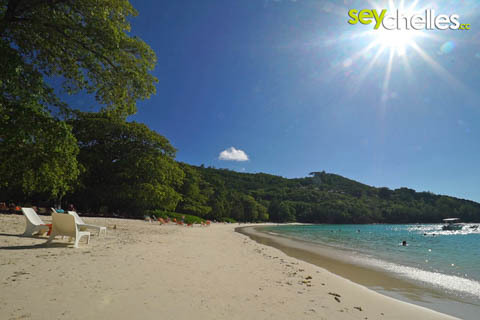 Other than that, Anse Soleil is a really nice beach with usually rather calm waters and a nice lagoon. 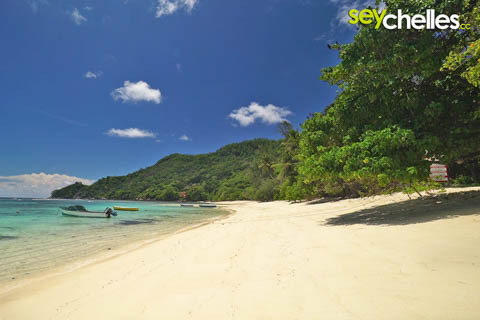 Anse a la Mouche is a beautiful, very flat bay in the southern part of Mahé. 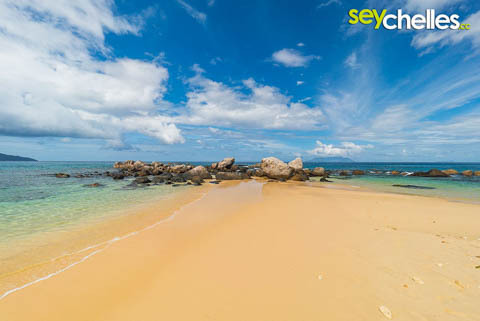 Depending on the season and the tides the sandy beach is narrow or extremely wide (up to 100+m), but the water is always shallow. 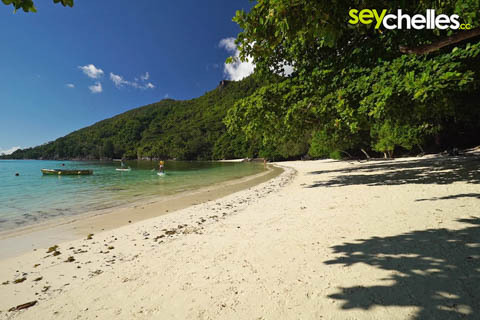 Anse a la Mouche is perhaps not the perfect beach for swimming. You have to walk out very far before the water gets a little deeper. Walking in the water though is only comfortable in a rather small area which is sandy and free of corals or seagrass beds. Anse a la Mouche is not very famous, but still a very picturesque bay and worth a visit. Especially at low tide when the fishing boats lay in the sand, or in the evening to watch beautiful sunsets. 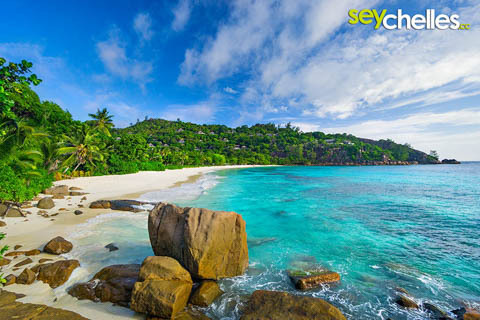 Grand Anse is a beautiful sandy beach more than 1 km long from the mouth of the Dauban river to the other end near the coastal road. Unfortunately, a power plant with huge power poles distracts a little from the natural beauty of this beach. You can easily park your car where the road bends sharply, right in front of the beach. Be careful when driving with a car, because there is a huge bump when you leave the road. Despite the size of the beach, the parking ground is hardly ever used and the beach is almost always empty. Lately, there was a new structure built at the entrance of the beach in an effort to make the beach more popular. It looks like a wooden jetty, but it´s rather a sun-terrace you can use for relaxing. 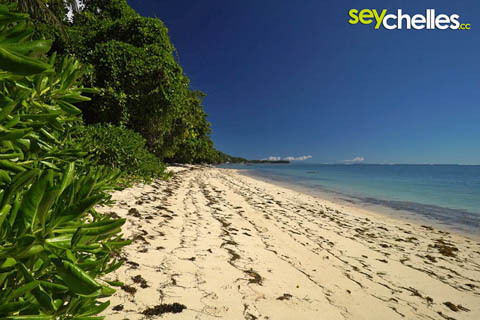 Only a short distance from Mahés west coast near Port Glaud lays the jewel Therese Island with one of the most beautiful tropical beaches we have ever seen. 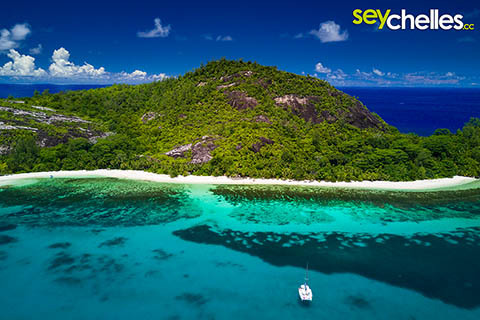 The tiny uninhabited island is about 1,6 km long and 160 m high with an abundance of coconut palm trees and lush tropical vegetation. Getting there isn´t really easy and so we ourselves have only been there once yet. But staying all alone on a tropical island is an experience to be had. Shady trees are available. The touristic hot spot on Mahé. 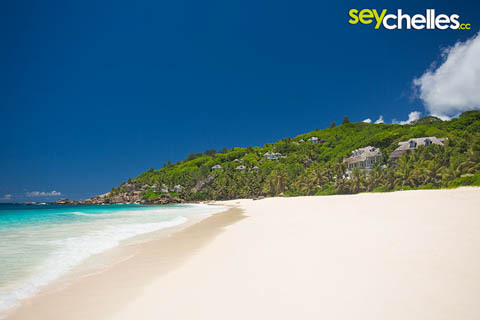 Many different hotels, self-catering apartments and other facilities at various prices are threaded along the road and the green hills behind this wide sandy beach. You can find restaurants, shops, along with providers for water-sport activities, boat trips, excursions and even a casino. 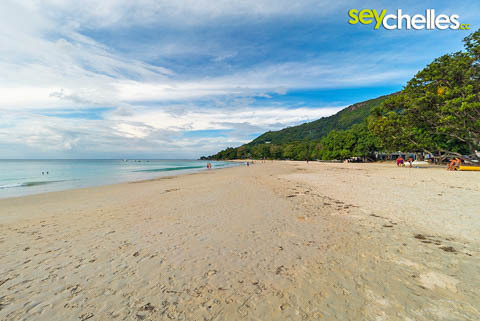 The continuous stretch of Beau Vallon is an about 1,5 km long sandy beach, if you take the whole bay interrupted with some granite rocks it is more than 2 km. 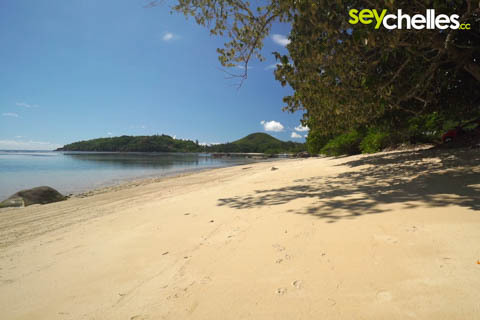 The fine sandy beach slopes gently down to the sea. 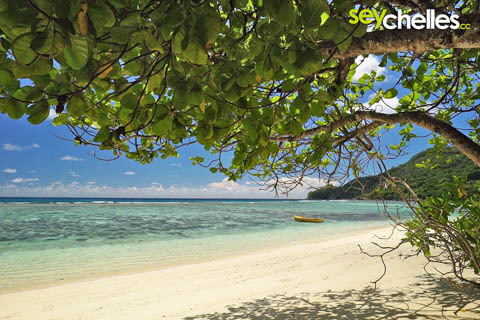 The main part is free of corals and therefore perfect for swimming. You can find lots of shadow under the trees starting at noon. 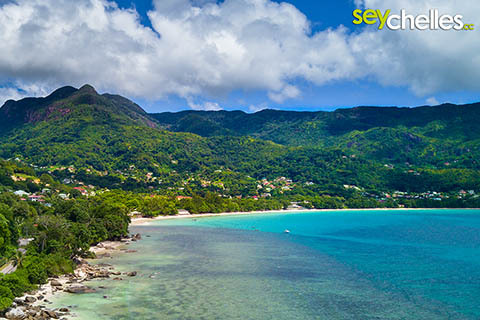 For us, Beau Vallon is not the typical Seychelles beach. 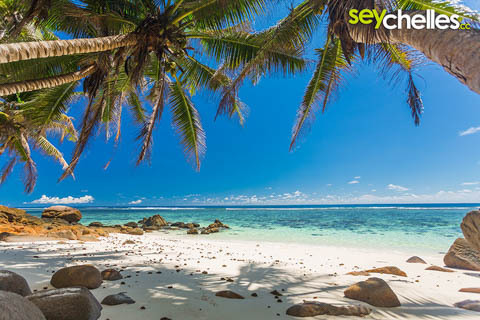 It has a slight European touch, but if you are looking for a long sandy beach with all comforts close by, or if you are travelling with small children, this might be your place. 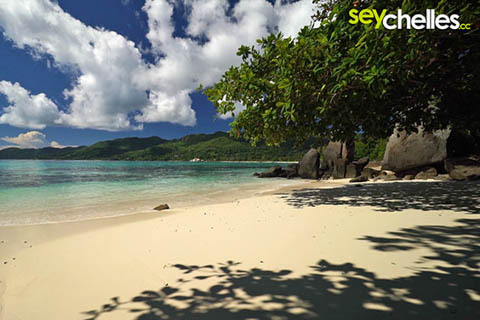 If you are looking for peace an tranquillity choose one of the many other Seychelles beaches on Mahé. 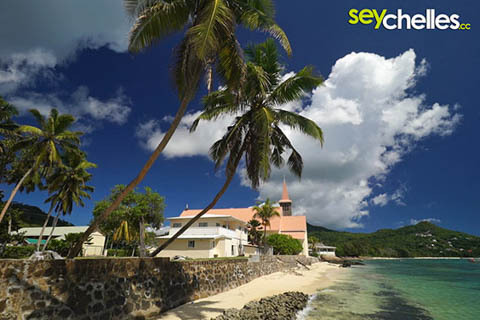 This part of Anse Nord D´Est in the northern part of Mahé will soon be home to a new hotel. The beach can be wild at times and then it can be hard to get into the water. If it is calm, it is perfect for swimming. There is also some shade available. Parking is difficult, so this beach isn´t particularly easy to get to. 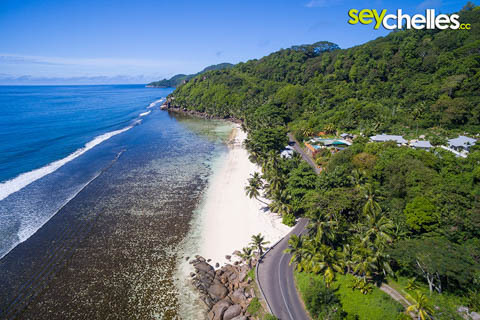 As the name Anse Nord D´est tells you, this is the rather rough coastline of Mahé in the northeast, probably not a beach to linger around the whole day, but tastes are different and the beaches along this coast at least are not crowded. 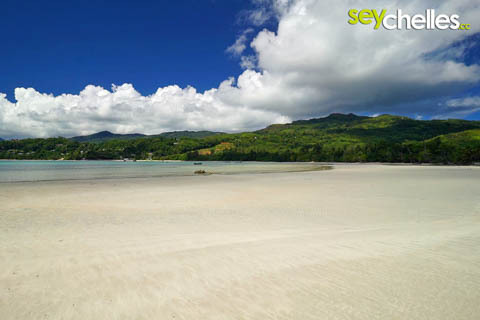 The northernmost part of Anse Nord D´Est is an actually pretty nice sandy beach, but unfortunately, investors have left a big building shell that is visible all over the place and spoils the otherwise nice beach. Shadow is rare to not available at all. The road is always close by but there isn´t much traffic on that road. 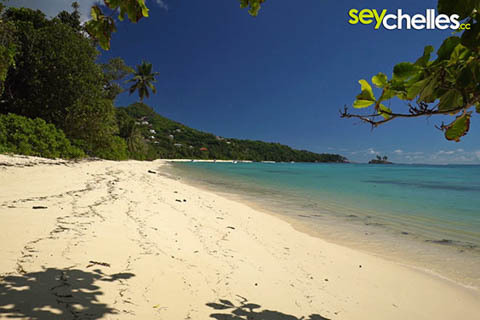 Anse Royale on Mahe is a beautiful long stretched but narrow beach with lots of different looks. Right at the northern tip, there is a small parking ground. This part is the shadiest one. Going into the water is possible on large parts of the beach. 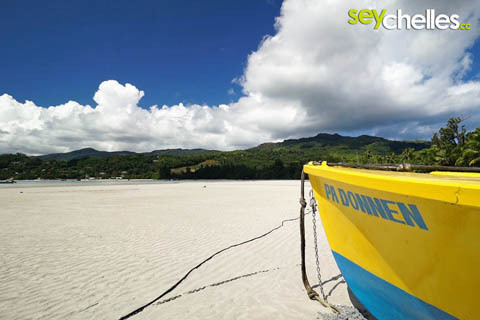 Along the central part of the beach, you will find a lot of picturesque fishing boats anchoring on the shore. The further you go south, the less attractive the beach gets. But at the end of the bay, there is a beautiful photo-spot where you can shoot the church from a wall towards the north. 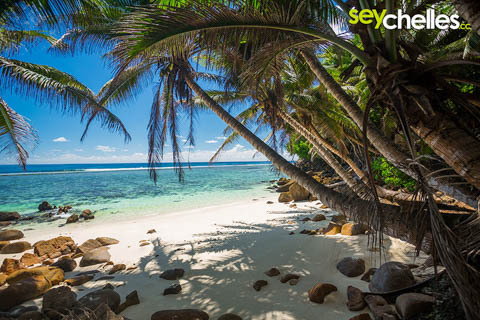 Anse Baleine is a beautiful tiny hidden beach between Anse Royal and Anse Forbans, with coconut palm trees spending shadow (be careful not to sit right underneath) and granite boulders spread around the beach and in the water. 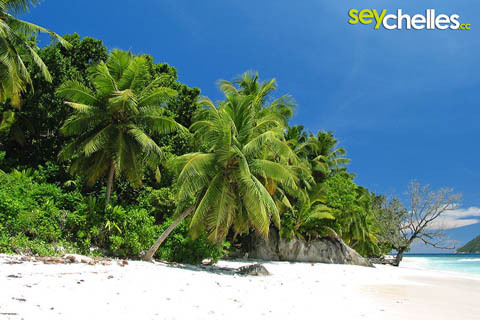 Don´t be disappointed if there is hardly any beach at all. These images were shot at low tide. And depending on the season there is more or less beach which is very natural. 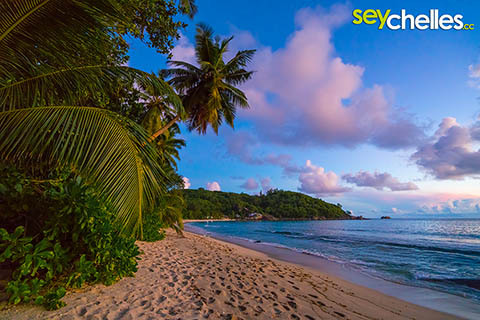 Anse Baleine is situated along the south coast road, 300-400m before you reach the surfer's beach restaurant. If you want to visit that little beach you might have to walk a bit along the road, because there is only space for one car to park in the corner of the road and we are not even sure if this place is meant for parking ;-). 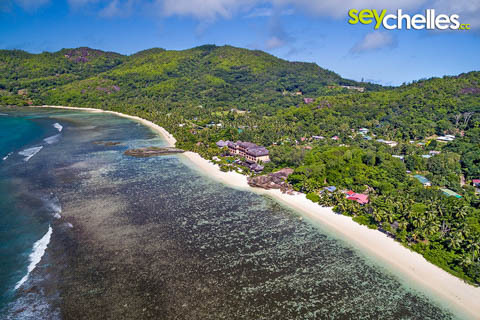 Anse Parnel on Mahé is the home of the Surfers Beach Restaurant and Self Catering Chalets on the South Coast Road. Therefore Parking is rather easy and you may take a snack during your stay. The beach is really nice, offering some shade especially from noon to afternoon. The water can be really shallow though, so swimming is not perfect. 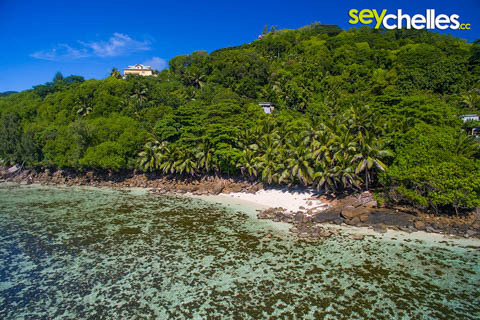 In the very remote south of Mahé almost at the end of the road, even after Anse Intendance, you find the wild and beautiful Anse Bazarca. It is not a beach for swimming and at the time when we´ve visited it there have always been huge waves and no police was present like on many other Mahé beaches, but it´s worth to walk or sit on the beach and enjoy this outstanding natural view for a while, or lay on the beach in the waves. 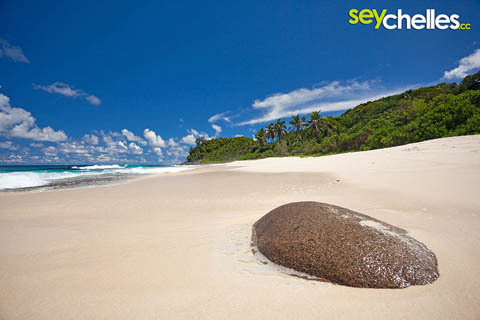 Anse Bazarca is one of the little secrets of Mahé that you should not miss.